Mission--PON is an organization within the community of Oxford that seeks to promote the Oxford business community, to recognize and maintain its historic nature and to respect its hometown character and culture. Meetings are held on the 2nd Wednesday of May and November at 7:00 p.m., with additional meetings scheduled when necessary. Attendance at meetings, held at Six On the Square, is welcomed. Membership is offered in 2 levels to meet the needs of members. Level 1, Basic Membership: $50.00; and Level 2, Enhanced Membership: $70.00. More information about membership and an online membership form found here. Membership fees, which go toward member's brochure and website inclusion, generate income which is used to help better Oxford. Tee shirt sales also aid in funding hanging baskets, holiday decorations, and other projects that PON is involved in. The "Riverwalk Project" is one such topic. To read more about PON, its history, goals, and accomplishments click here. "Friends of Promote Oxford Now- Partners in Our Community" are an important part of the organization. Their input and participation are greatly appreciated, and attendance at meetings is welcomed. Donations may be made at any level and sent to the above address. The American Legion is a not-for-profit organization, and the world’s largest veterans’ organization. It was instrumental in the creation of the Veterans Administration and is universally recognized as the originator of the GI Bill of Rights. The American Legion was chartered by Congress in 1919 as a patriotic, mutual-help, war-time veterans organization. A community-service organization which now numbers nearly 3 million members -- men and women -- in nearly 15,000 American Legion Posts worldwide. We provide the community with a place to go for Sunday breakfast. We help the community & school with scholarships and funds for their projects. The Oxford Fire Dept. Auxiliary is dedicated to supporting the activities and members of the Oxford Fire Department. The Auxiliary will help to foster good will, sociability and friendship among and between the Fire Department and residents of Oxford. The Grange is a community service-oriented, agricultural fraternity. They help support several community organizations, including the Oxford Academy Band, Drama Club, and Pumpkin Shell. During the Christmas season, they participate in the Oxford Community Christmas Baskets program, as well as supplying many of the delicious homemade cookies for the Oxford Holiday Tree Lighting Ceremony. The Grange also recognizes and honors an outstanding member of of the community with their Citizen Of The Year award. Meetings are held on the first Wednesday of every month, from 7:00 to 9:00 PM, and they take place in the Church Hall of the United Church of Oxford on Fort Hill Park. Fellowship after meetings with refreshments. The Museum will be open each Thursday from May 6th through October 7th, 2004, from 1:00 - 3:00 pm. The Museum is closed during the winter months, but arrangements can be made for special visitations by calling ahead. For details/information call: Fred Lanfear- (607) 843-9446. Aim: To create and foster a spirit of understanding among all people for humanitarian needs by providing voluntary services through community involvement and international cooperation. Part of the worldwide fraternity of Freemasons, the oldest and largest fraternity in the world. The aims of our fraternity are friendship, morality and brotherly love. 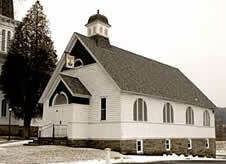 Oxford Lodge contributes over $3,000.00 each year to various youth and children's programs in the Village and Town. The Oxford Rod & Gun Club, founded in 1963, is located on Ingraham Road in Oxford, New York. Today it serves 139 members. We offer a wide range of activities throughout the year such as a Clambake, Trap Shoots, Slug Shoots and Archery. The club also offers facility rentals for weddings, anniversaries, dances, and the like. 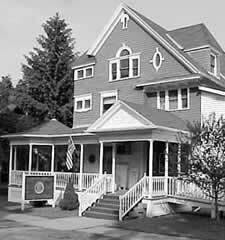 The Joseph Jefferson Literary Society is the 1st literary club in Oxford, NY, organized in the fall of 1891. History: This Literary Club was one of the three original book clubs in Oxford, organized in 1905. It had 12 members back then, and today it has 9 members. The early book clubs were formed as a place for women to get together, socialize, and discuss current issues. Today, the club serves not only that function, but it also serves as a great way for women to learn about a variety of books while at the same time promoting literacy. The Oxford Senior Center is open to anyone sixty years and older, living within the Oxford township, who would like to get out and have a delicious hot meal, in the company of others, in a warm and friendly atmosphere.